Since Philips Hue smart lighting products are so expensive, people are always on the lookout for good smart bulbs that are a bit more affordable. Well, look no further than the Sengled Element Classic A19 60W Equivalent Soft White Smart LED Bulb. 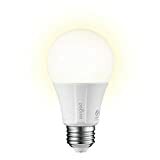 This top-rated smart LED bulb works with Alexa, Google Assistant, and popular smart home systems like SmartThings and Wink. 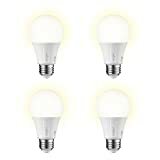 It comes in either soft white or daylight, and a single bulb costs just $9.99. 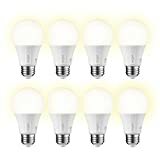 But wait… Amazon also sells 4-packs that drop the price per bulb to $9.75, and 8-packs that drop the price per bulb to just $9.62. You’ll never find another smart bulb this good for a price that low, so take advantage while you can. CONTROL YOUR LIGHTS, AT HOME OR AWAY: use the iOS or Android app to set lighting schedules, dim or turn your lights on and off. Control your lights remotely and have the lights on before you get home at night. MONITOR ENERGY USE: monitor electricity use (kWh) from anywhere from the iOS or Android app. See if you forgot to turn off the lights, then remotely turn off for added savings. ENERGY EFFICIENT: LED bulbs use 80% less energy than incandescent lighting. Sengled bulbs last for over 20 years and are ENERGY STAR certified. Kits and bulbs come with a three-year warranty.